How did you get called into Youth Ministry? For me, serving in youth ministry at Mountain Christian was a really natural response to the effect that amazing youth leaders have had on my life. In my middle and high school years, my youth leaders were some of the biggest influencing voices in my life and walk with God. After high school God really gave me a heart for kids going through the vulnerable and confusing time that is the early teenage years. I jumped on board as a youth leader then, and fell completely in love with it. How have you seen God work in you and your volunteers thru your ministry? One of the most surprising things about youth ministry to me is that as much as you’re there to give time and love to the kids, you end up getting SO much in return. 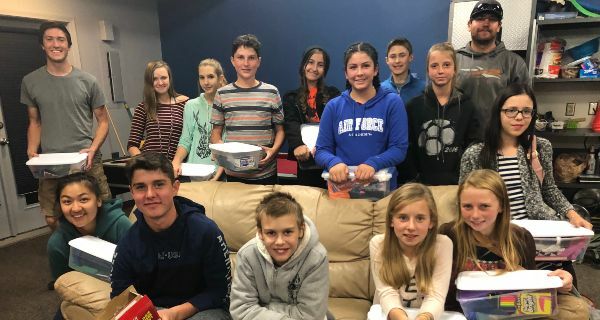 We have a really awesome team of young adults who are leading the middle school youth program right now, and one of the biggest blessings of this ministry is to get to work with them and see how God calls each of them deeper into relationship with Him, through their service at youth group. It’s clear in their lessons, in the love that pours out of them for the students, and in the way they build each other up and love each other as a team. What has been the hardest aspect of serving and how did God use that to grow you? For me, the very hardest thing about serving is giving everything you can give to a group of kids, and then seeing some of them fall away from their faith as they get older. I’m sure any parent can sympathize with this tenfold, it’s like seeing a part of your heart die. God used it to show me a tiny part of how He feels when we turn away from Him. He also taught me that loving with His love is incredibly painful sometimes. It makes me appreciate the lengths to which He went to have the chance to love us, even knowing some of us would never love Him back. It makes me more like Jesus to love like that. And also, the kids who end up being your success stories make it all worth it! It’s so hard to pick just one thing, so I’ll say 2! One is the intense fellowship with the youth leadership team. I’ve never been to war, but youth group feels like going into battle every week, fighting it out for young souls, and it’s like having family at my side. Two is the way God is able to use my past, including the (many!!) mistakes that I’ve made to speak into kids’ lives. God is so gracious, not only does He forgive my sins, He uses them to make me a better youth leader, teacher, and friend, to these kids. He’s called the redeemer for a reason. What would you say to someone who doesn't feel equipped to serve? I would say that I totally understand that. Every time I stand up to teach a lesson at youth group I have a moment where I’m just overwhelmed that God would choose to speak through ME. But I would say that your feelings are the least important part of the decision. God doesn’t call the qualified, He qualifies the called. I get that youth ministry is scary. There’s not a lot more intimidating than being watched by 15 judgy 11 year olds. But if there’s any part of you that feels that youth ministry may be something God is calling you to, obey. Trust God to work the rest out. Why should people get involved in ministry? I feel like every week we get through a youth group without serious injury is a ministry success! But one of my favorite nights so far this year was our parent meeting in September. We celebrated a year of Fire and Ice middle school youth group with pizza and a giant jumper. We also got to share our vision for the ministry as a leadership team with the parents. We’re a young group of leaders, so I felt like it was a success that we were able to communicate our passion for MCC’s young people to deepen their relationships with Christ, as well as lay out a practical plan for the upcoming year. We’re ready for God to rock MCC and the East mountains through this ministry in 2019. What do you want your volunteers to know? Youth ministry is more than a once a week volunteer opportunity. It’s grueling and inconvenient, and you’ll find youth kids taking over your heart and mind, and maybe even your couch. But for every drawback, there’s an opportunity to speak truth into a student’s life. God is at work here, and it’s an amazing thing to be a part of.